As a highly digestible, broken-cell wall—Chlorella is far from it’s depths in the ocean floor. Providing a great dosage of protein, vitamins and antioxidants, Chlorella is an easy-to-take way to cover all of your nutritional bases. Recommended Dose: Take 1 tablet three times per day with a glass of water. NON-MEDICINAL INGREDIENTS: Calcium Phosphate Dibasic Dihydrate, Microcrystalline Cellulose, Croscarmellose Sodium, Stearic Acid, Magnesium Stearate, Silica. CONTAINS NO: Dairy, egg, artificial preservatives, colours, artificial sweeteners, yeast, wheat, gluten, soya, or corn. Consult a health care practitioner prior to use if you are taking blood-thinning medications (e.g. Warfarin) or have bleeding disorders; or if you are a tobacco smoker. Consult a health care practitioner if you have problems with or are taking medication or natural health products for blood pressure, immune function, and cancer. 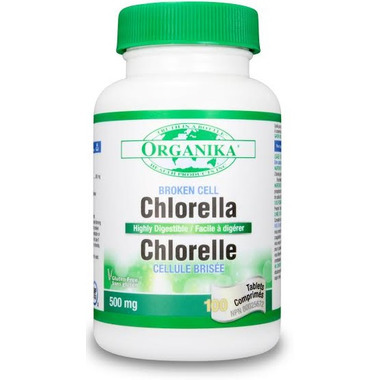 Do not use if you are pregnant or breastfeeding; or have known allergy / hypersensitivity to chlorella, its constituents, or members of the Oocystaceae family. Organika make great products at a reasonable price. This chlorella is no different. It smells like the more expensive stuff and its potency is on par with the brand I usually buy in the US. GOOD JOB!